C.S. Lewis meets CSI...when Michael Angel presents a new series mixing magic, mystery, and forensic science - 'Fantasy & Forensics'! She's the LAPD's best corpse-kicker. Dayna Chrissie, LAPD's leading Crime Scene Analyst, relishes finding the one clue that can solve a crime. When she finds a golden medallion on a body that's been dumped at a downtown construction site, she doesn't think it's all that unusual. Until that medallion's enchantment brings her to the magical world of Andeluvia. She must find a killer in time to stop a war. Dayna discovers that she's been summoned to solve the murder of the realm's king before war breaks out between Andeluvia and the Centaur Realm. But no one wants peace when war offers chances for riches and glory. So Dayna ends up with a team of cast-offs: a centaur wizard with father issues, a brash griffin warrior, and the world's unluckiest magical deer. And the trail leads where she least expects it...back home! When the trail of evidence brings Dayna and her new friends back from Andeluvia to Los Angeles, she must use all of her forensic knowledge in order to solve the case. Included with this story are previews and a special offer for the next story in the 'Fantasy & Forensics' series, Forensics and Dragon Fire. "Angel manages the nearly impossible...creating memorable characters in the midst of an intriguing mystery, action, humor and heart." "This clever, humorous fantasy springs to life from page one..."
"Fast-paced action and sly wit make Angel's writing irresistible fun." Q - What makes the Fantasy & Forensics series special? A - I've enjoyed epic sword and sorcery types of fantasy since I was old enough to pick up a paperback. At the same time, I've always been a mystery fan - specifically, of those classic thriller or suspense novels that kept you up all night to finish them. So I wrote the 'F&F' books as a unique mix of the two genres. 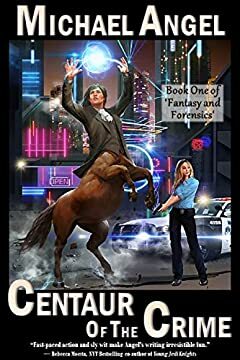 Crime Scene Analyst Dayna Chrissie has to solve some nefarious wrongdoing in each book using forensic science - but in a world of sorcery and mythical creatures! Q - Tell us more about Dayna Chrissie - what makes her tick? A - Dayna starts out as that person you always find at the office on a Saturday. But over the course of this book and its sequels, Dayna becomes attached to her friends to the point that they become like family. This serves her well as she encounters wizards, dragons, phoenix, demons, wyverns, and unicorns in her later journeys!